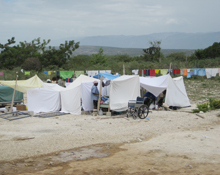 Emory continues to support Haitian relief efforts. For Jihan Francois, the need to help earthquake victims in Haiti is intensely personal. Her 8-year-old cousin died from internal injuries sustained after the Jan. 12 quake toppled the little girl’s elementary school. The Emory community continues to seek out ways to ease the suffering resulting from the quake that killed tens of thousands of Haitians and injured many more. The efforts have come in many forms, from teach-ins to fundraisers to prayer vigils to legal advice to shoe drives. When the University requested French or Creole speakers willing to serve as interpreters for Haitians evacuated to Atlanta, more than 50 people signed up within two hours. Within two days, more than 300 had. The first flights carrying earthquake victims for treatment in Atlanta area hospitals began arriving last week. The law school is coordinating with local attorneys to assist Haitians already in the United States who want to apply for Temporary Protected Status. The Emory College Staff Consortium is collecting loose change for Partners in Health until Feb. 12. For a list of current efforts and volunteer opportunities vist the CEPAR Web site. In a single day, the Health Organization for Latin America (HOLA) raised $1,164 and collected 539 pounds of medical supplies. “Students mobilized with enthusiasm and humility and lent of their time graciously. The spirit to do something for the Haitian community was contagious,” says Sulma Jessica Herrera of HOLA, a newly created student organization in the Rollins School of Public Health. Across the campus, other relief efforts are in the planning stage. Emory’s Office of Critical Event Preparedness and Response (CEPAR) is coordinating the University’s relief efforts and asks that groups send finalized plans regarding events and donations to emergency@emory.edu.